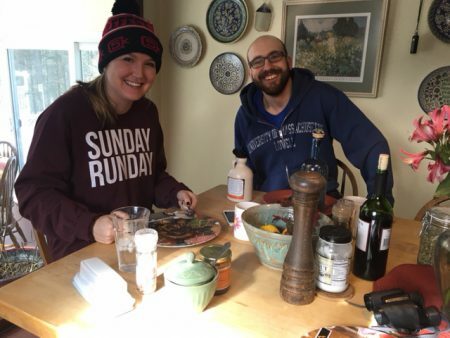 I had a fun little trip down to North Carolina and got to skip most of that snow/sleet event that hung out over Boston for 2 days, but it feels good to be back and settling into the regular routine once again. As usual, I wanted to update you all on this week’s training! Monday – My travel day. However, my flight was around 9 am, so I got up at 4 am to squeeze in a workout on the treadmill. Workout was 2 mile warm-up, 5 x 2 minutes @ 7:25, 5 x 1 minute @ 6:59, 5 x 2 minutes @ 7:25. I had 30 second recoveries on the 2 minute intervals and 90 seconds on the 1 minute intervals. It was tough, but I felt so proud of myself for getting up early to get this done. This was definitely one of those days I would have skipped running if it wasn’t for having a coach. Tuesday – 6 miles easy. I got up early once again to knock this off on the hotel treadmill. 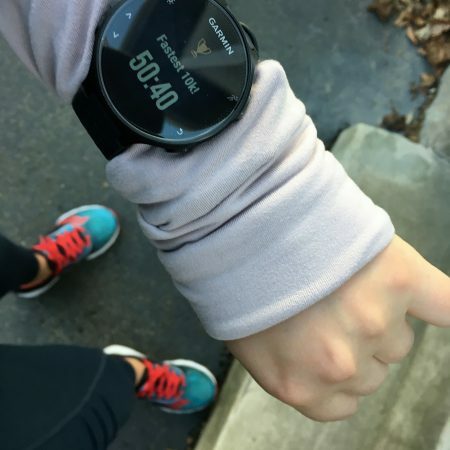 For the first 3 miles or so, I was humming along, doing just fine and then WHAM – the treadmill jerked to a sudden slow-down of just a hair above walking pace causing me to fly forward. Then, within a matter of seconds, it got back up to speed. I was super confused and frustrated. The first time, I just kind of hoped it wouldn’t happen again… But it did. Roughly every quarter to half mile, it would suddenly slow down. But by this point, I really wanted to get the full 6 miles in. I just focused on playing it super careful and got really good at estimating when it was going to slow down on me so I’d be prepared with my hands on the bar. 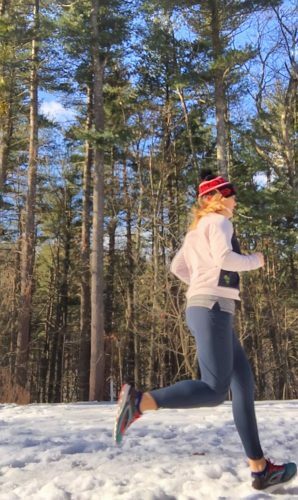 Wednesday – I was supposed to try to squeeze in another easy 5 miles but I really could not stand the thought of dealing with that awful treadmill again. The area the hotel was in was also right off a busy highway so running outside was not a safe option. I decided to bag this run. Thursday – I flew home in the early afternoon, so was able to hit up the comfortable, well-functioning treadmills at my gym in the evening. I knocked off an easy 6 miles with a little core work to round out the day. Friday – Workout day. This was to consist of a 15 minute warm-up followed by 2 x 2 mile repeats at 7:36 with 3 minute recoveries. Then, 1 x 5 minutes at 6:59. I knew this was going to be super tough, but I was excited to give it a shot. I also ran this one outdoors so I couldn’t rely on the treadmill for hitting the paces. Here’s how I did – 1st set: 7:36, 7:34. 2nd set: 7:44 (I was 100% riding the struggle bus on this repeat), 7:36. I was happy I was able to bounce back for the 2nd repeat in the set, but this was definitely mentally challenging. I felt like I was working really hard and then I had the 5 minute interval looming over my head. Somewhere during the 2nd set of mile repeats, I realized there was no way I was holding a 6:59 pace for 5 minutes that day. I just didn’t have it in me. So I just said to myself that I would gut it out and give it everything I had for the last interval and whatever the pace was, I wouldn’t be upset about it. It ended up being 7:24. Pretty far off from the 6:59 I was aiming for, but a really solid effort. I think part of the issue might have been that my body was still a little out of rhythm from the travel the day before. I don’t know for sure, but I hope that if I get a similar workout again, I’m able to get a little closer to that 6:59 pace. Saturday – 60 minutes nice and easy. I had to get up kind of early to fit this run in, which always bothers me on weekends (since my sleeping in opportunities are pretty limited) but the plus side was that I was treated to some beautiful views of the sunrise. Winter running can be kind of pretty I guess if you can get past the cold temps. How was your week? Can you believe it’s almost February?? This entry was posted in Training, Uncategorized and tagged 2 Generations Running, Eat Slow, Half Marathon Training, Run Fast, Teff Pancakes. Bookmark the permalink.